“Don’t you ever run out of stuff to write about?” My barber asked after reading my last 1,600 word marathon column about the post on the city bike trail that nearly broke me in half. “Not really. Most of the time my typing fingers can’t keep up with my harebrained ideas,” I replied frankly. The truth is I don’t chase columns. Even as deadline approaches and there’s still nothing there, I just keep riding and it’ll come to me, like it did on a business trip to Mankato, Minn. this month. All the inspiration I needed was an afternoon ride on the bike trail past Mount Kato Ski Resort, now closed in the record 70 degree mid-March heat. For years I’ve ridden by here wondering what it would be like to scream down that hill on my bike, right over the snow-pack. 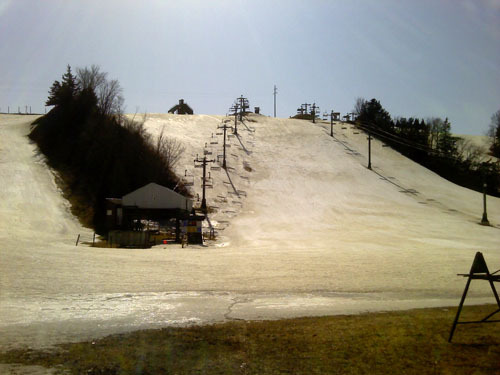 While the back hills of the resort are open in summer to mountain biking, the face of the ski hill is strictly off limits to cyclers. It would take a fool bigger than me to try this stunt in the middle of the afternoon. I’m sure you’d be chased away or even arrested in short order. “But,” I thought. “Who’d be watching the ranch at midnight? I tried hard to push the silly notion out of my mind when I returned to the hotel room that evening. But the more I tried to sleep and the closer it came to 12:00 a.m., the more I became obsessed with making a starlit run at old Mount Kato. Later the thoughts started getting out of control. The next thing I knew I was standing in front of the bathroom mirror rigging my video phone to my forehead utilizing a baseball hat situated backwards over a stocking cap. After 20 minutes in the lavatory, err… laboratory, my hat-cam prototype was ready for deployment. At the stroke of midnight I was back on my Raleigh heading for the hills with my phone mounted precariously to my head, adrenalin now blurring any sense of reason my parents instilled in me. I began zigzagging up the steep hill from the side, scaling the slushy grass next to the man-made snow slopes, forcing my bike up in front of me one careful stride after another. I could hear water streaming under the ice, quickly finding the path of least resistance to the bottom. The surface of the slope appeared wet, wavy, icy and steep, conditions not conducive to bike riding at all. Still I forged on with the risky mission. Finally perched at the top breathing heavily I mounted my bike, barely able to stand still on the glazed icepack long enough to get both legs over her without falling down. Surveying the valley below I was just managing to suppress the fear of being caught, hurt or both before escaping the scene. I decided to engage the front headlight to accommodate the video even though it made me more visible. “In a half hour, you’ll be back in the hotel room,” I said out loud while trying to envision a safe and successful descent. Hat-cam in place I said a little prayer, pushed the start button on the video, lifted my feet and slowly let the brake out, bound for the bottom or bust. Bump, bump, bump, skid, and bump I negotiated the bike successfully for the first half of the ride when I heard the beep indicating the 30 second limit on the recording function had been met. With the video complete I turned out the light, managing my way carefully but speedily down the rest of the hill in near total darkness; bump, skid, skid, bump. I wasted no time pushing back through the wet grass and into the parking lot. From there it was a three mile victory sprint back to the hotel. Of course the video turned out to be completely dark except for a couple distant streetlights as the hat cam was angled toward the sky instead of the ground. I guess it’ll be back to the Lav... Err.. Laboratory with that little invention. I’m actually surprised the phone never bounced free from the hat. There’s a scenario I had not planned for. Never-the-less, you can hear the bike bouncing down the hill and some of my jittery narration if you check out this column at dansbikerides.com. Sorry there wasn’t a more cathartic finish to this story like a gnarly face plant, brutal chase, tazering or trespassing charge, but it looks like even I can still turn a successful mission now and then. Traffic Tip: Every bike ride is in High Definition.